Yet wireless systems can be slightly mysterious, prompting suspicion among some users - particularly if they’ve experienced problems for unclear reasons. The same goes for other transmitters, especially those of TV stations. And because these transmitters send out very powerful signals, they are a common cause of interference for wireless systems. Even though a wireless system needs a clear frequency for the area where it’s going to be used, every frequency is used again and again across the nation. Again, this is because the power of the output signal of wireless systems is very low. Keep in mind, however, that there is no absolute guarantee that a clear frequency in one area will be clear elsewhere, even just across town. This is an aspect about wireless systems that sometimes puzzles users; the government takes care of the problem for the high-power signals of commercial broadcasting, but wireless system users are responsible for avoiding this problem on their own. Fortunately, most modern wireless systems (developed in the past 15 years or so) offer some degree of frequency agility (also called frequency synthesis). This means that the user is able to select an operating frequency from a number of possible choices, ranging from as few as four frequencies to 1,400 or more, depending upon the model. The more frequencies offered by a wireless system, the better the chance of finding a clear frequency that is not being used by someone else in the area. Further, in larger cities, where there are more frequencies occupied by numerous users, the ability to choose from a larger number of frequencies is especially important. Having plenty of open frequencies also helps wireless system users get around another potential problem: intermodulation (or intermod for short). This can occur where the frequencies of two transmitters (of any type) “combine” in a wireless system receiver, resulting in noise and interference. Most often, intermod is caused by a combination of the frequencies from two TV transmitters, or by the frequency of a TV transmitter combined with the frequency of a wireless system transmitter. Because the source of intermod is usually not under the control of the wireless user, there is usually little choice except to change the frequency of the wireless system. This is yet another reason for choosing a wireless system outfitted with a wide range of frequency selections. By law in the U.S., wireless systems are supposed to operate only on TV channels not in local use. If a wireless system happens to cause interference to TV viewers in the area of its use (and this can happen even with their lower output level), the interference is likely to be reported, resulting in the user drawing unwanted attention from law enforcement. Thus it’s vital for the wireless system user to keep handy a list of local TV frequencies in use (available online at www.antennaweb.org/aw/Address.aspx), and to avoid those frequencies. Although many wireless systems can “automatically” select frequencies or scan to see local RF activity, it is still possible to select the frequency of a local TV channel and get the innocent user into trouble. Wireless systems are available for “VHF” and “UHF” frequency ranges (also called bands), roughly corresponding to VHF TV channels 7 though 13 and the UHF TV channels 14 through 69. The question as to which range is “best” has pretty much been settled by the wireless manufacturers, who generally only offer systems with numerous frequency choices in the UHF band. Additional bands used by wireless microphones include the “944 MHz” band between 944 - 952 Mhz. This is a band reserved for use exclusively for broadcasters. Also, the “ISM” band between 902 - 928 MHz is an unlicensed band used by several wireless microphone products. Finally, the 2.4GHz band is another unlicensed area used by wireless manufacturers. Although the UHF TV band classically extended up to channel 69, channels 52 to 69 (698 MHz to 806 MHz) has been converted to non-TV use - divided up by the U.S. government/FCC and auctioned to various companies for wireless devices available on the consumer market. Accordingly, it is now against the law to use wireless microphone systems in this band. Even though a system has operated in this range without problems for years, it is illegal. With all these competing signals in the air throughout the VHF and UHF bands, even high-quality wireless systems can run into problems when operating at distances of 100 feet or less between the transmitters and receivers. In addition to the low transmitter power, two other problems can limit the range of wireless systems. The first is signal absorption due to building construction and internal equipment, or shielding by metallic objects such as electrical wiring, air conditioning ducts, storage cabinets and the like between the transmitter and the receiver. Note the dual antennas on this wireless receiver, indicating it uses diversity. 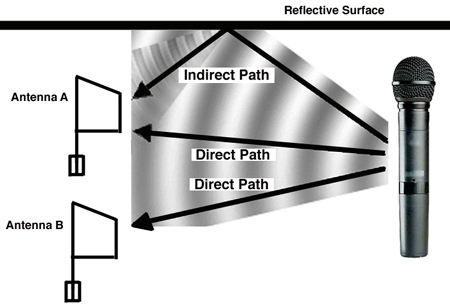 The term “line of sight” is often used to express the idea that the signal path from the transmitter to the receiver should be open and clear of obstructions. This simply means that if the wireless user can physically observe the receiver antenna, RF signal absorption is likely to be low. The second problem is called multipath. It’s a phenomenon that results in numerous small areas where little or no wireless signal is present because of reflections and the resulting phase cancellations, and it often tends to occur within a fairly short distance between transmitter and receiver. To overcome the problem, a majority of modern wireless receivers now use a technique called diversity. With diversity, two slightly separated receiver antennas are used, making it very unlikely that both will simultaneously be in one of the low signal (multipath) areas. The receiver automatically selects the antenna with the strongest signal, not only solving multipath, but also increasing the reliable range of a wireless system. A final note: most users are surprised to learn - despite urban myths to the contrary – that the U.S. government requires wireless systems to be properly licensed prior to use. Unfortunately, the agency in change of issuing these licenses (Federal Communications Commission, or FCC) makes it very difficult for conscientious users to actually comply. As a result, the vast majority of users don’t go to the trouble. But keep in mind that unlicensed wireless systems are in technical violation of FCC rules, and therefore are theoretically subject to fines. As a practical matter, the FCC has neither the resources nor the inclination to go after the “average” wireless user, so the risk is low. But not zero. Due to the recent changes in spectrum allocation, this issue is being re-visited. It appears that the FCC may make it easier for typical wireless microphone users such as churches, theaters, musicians, etc. to register their products. This would also be beneficial in the event that additional types of consumer devices appear and complete for the same spectrum we are currently using. Although the popularity of wireless microphones continues to grow, there’s no denying that they present more opportunities for problems than their wired counterparts. In addition to the normal acoustic concerns that come with any mic are the complications of RF (radio frequency) transmission, interference, frequency selection, batteries and several other issues. And technical improvements in wireless systems have not entirely kept pace with increasing frequency congestion, digital television and other recent complications. Still, the hundreds of thousands of wireless systems employed in the U.S. is compelling evidence that the majority of users will live with the added challenges. Besides, many of the problems encountered by wireless users are largely avoidable, and happen primarily due to oversights, mistakes and misunderstandings. Addressing the following common issues greatly improves the reliability of wireless systems and goes a long way toward ensuring trouble-free operation. Issue: Frequency planning and coordination. Wireless systems share the RF spectrum with TV stations and several other types of authorized users. As a result, interference is very likely unless appropriate precautions are taken. Solution: The first step is to determine the TV channels that broadcast over the air in your area. When the local TV channels are known, they can be compared to the frequencies of the wireless systems. If there’s a conflict, the wireless frequencies must be changed. This is relatively simple for synthesized systems as well as ones that search for vacant frequencies, but the solution is more difficult for fixed-frequency wireless. Despite the inconvenience, wireless systems should not be used on occupied TV channels. Not only is interference almost certain, the practice is illegal. Issue: Intermodulation. Wireless systems can also experience severe interference even when operating on “vacant” frequencies. This is created by intermodulation distortion - basically two strong signals on other frequencies combining in the wireless receiver to create an interfering signal. In one variation of intermod shown here, the frequencies of two wireless systems can combine to “gang up” on a third system. Called “intermod” for short, generally this type of interference is more common than direct on-frequency interference from other transmitters. Intermod is typically caused by other wireless systems, or by other wireless in conjunction with local TV signals. Even single systems can be affected, but the probability of problems grows roughly proportionally to the square of the number of systems in simultaneous use, plus the number of active analog TV channels present. By the time eight or more wireless systems and six or more TV channels are involved, it can become quite challenging to find usable frequencies. Solution: One or more wireless frequencies will have to change. There is generally no other practical solution. Again, synthesized systems and “auto-search” frequency finding can be very helpful. However, any frequency can potentially interact with any other, so changing one frequency can solve one problem can create another - or several others. When changing frequencies or searching, it’s absolutely critical that all RF systems of any type at the location be turned on and operating. As one clear wireless frequency is found, that system must be left on, and the next system tested until all are operational. Otherwise, the situation can quickly become a snarl of changes and more changes, “phantom” problems, confusion and frustration. Some manufacturers offer assistance in selecting usable frequencies, and as always, don’t hesitate to get your sound contractor involved. In addition, there are a number of readily available software packages that are designed to aid in calculating your frequencies so that intermod problems are avoided. 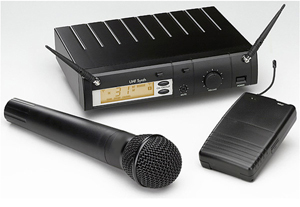 Several manufacturers of wireless microphones offer this kind of software, and there are third-party options as well. Often, the third-party solutions are the most flexible – offering coordination of many types of systems by most manufacturers. Issue: Shielding or covering antennas. In order to properly launch a radio wave, a sizeable volume of free space is required around an antenna, and in general, they must be unobstructed. Solution: For efficient operation, all wireless system antennas must be kept clear of metallic objects that can weaken and distort signals in addition to reducing range. With bodypack transmitters, the antenna must be kept away from the mic cable, the bodypack case and ideally, the wearer’s body. Securing antennas to the transmitter case and tying antennas to cables, as is sometimes done, can be absolutely deadly to range. Skin and flesh can absorb RF energy, so it is best to have the transmitter case and antenna away from the body. Further, receiver antennas must extend away for the receiver case, as well as away from other antennas, equipment racks, other equipment, cabling and, again, metallic objects. Large metal structures like ductwork can create serious multipath issues. 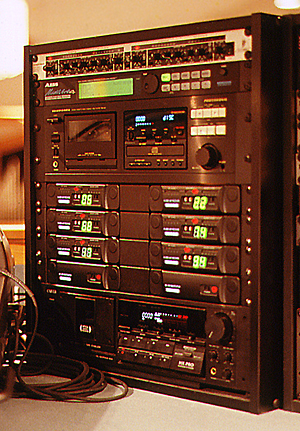 It’s best to mount receivers at the top of the rack so that the antennas extend above and away from the rack and other equipment. Using rear-mounted antennas inside a metal rack will almost always result in very poor reception. For multiple receiver installations, the common practice of positioning front-mounted antennas in a “V” configuration, with all the antennas parallel, will also reduce range. It causes them to function together somewhat like a TV antenna that’s pointed upwards. Even worse is when antennas from two different receivers touch. Not only will range be seriously compromised, interference becomes much more likely. In such a situation, it is much better to incorporate a single pair of antennas and then an antenna splitter to distribute the signals to the receivers in the rack. Issue: RF path. A clear path between the receiver and the transmitter is also required. This is sometimes called a “clear line-of-sight,” but remember, light will pass in a straight line through a small hole while radio waves will not. Solution: Similar to the free space needed around an antenna, radio waves require a sizeable space in which to travel. The amount of space necessary depends upon frequency - the lower the frequency, the more space needed. Create an imaginary tunnel of open air between the transmitter and the receiver antennas. For UHF systems, a tunnel diameter of 3 feet or so is usually adequate, but for VHF systems, it should be at least twice as large. There also should be no metallic objects - scaffolding, iron beams, cables, cabinets, pipes, etc. - within this space. In particular, large flat metal objects such large ducts, rows of cabinets, truck bodies and the like that are parallel to the path should also be avoided. Even though they might not be in the direct path, they can still act similar to a mirror, reflecting RF energy away from the direct path. Systems with diversity reception help avoid dropouts in these situations, but range still can be reduced considerably. Issue: Long antenna cables. Sometimes it’s necessary or desirable to locate antennas at a farther distance from a receiver. RF coaxial cables can be used to connect the remote antennas to the receiver inputs. However, they typically have considerable losses that will reduce operating range. The amount of loss depends upon the size, construction and quality of the cable, and upon the operating frequency.). Even high-quality RG-58 cable will have a loss of about 8 dB per 100 feet at 200 MHz, and about 17 dB at 700 MHz. Since every 6 dB of loss cuts range by half, the working range with 100 feet of this cable will be only 40 percent of normal at 200 MHz, and a mere 14 percent of normal at 700 MHz. Premium RG-58 type cables, such as Belden 7806R, are better, offering about 4.7 dB loss at 200 MHz and 8.9 dB at 700 MHz. Still, at 700 MHz, only 68 feet of this cable will cut range in half. Solution: If long cable runs are s necessary for your wireless systems to work properly, skimping on the cost of the highest quality cables available is a bad decision. For the best results, a premium foam-dielectric cable such as Belden 9913 should be used. This cable has only 1.8 dB of loss per 100 feet at 200 MHz, and 3.6 dB at 700 MHz. Generally, it’s preferable to run audio cables out to remote receivers, keeping RF cables short. This is particularly true with runs longer than 75 feet or so. If remote location of the receivers is not feasible, go with the high-quality, low-loss cable noted above. In-line RF amplifiers can also be used to boost the signal before the long cable run. These devices require power, and add cost. So before thinking that RF amps are the way to go, consider how the system can be configured to avoid using them and still keep your cable loss to a minimum. Issue: Batteries. Simple but true and most certainly the number-one cause of wireless problems the world over! Fortunately, it’s the one that’s easiest to fix. The most common cause of short battery life is poor quality or old age, along with mixing used batteries with new ones and simply losing track of how long a battery has been in use. Some sound operators also fail to understand that, when turned on, wireless transmitters draw power even if not being used, and that the “mute” switch does not affect the current drain. Solution: Check transmitter batteries prior to every use. Get a battery tester to help you determine a good battery from a bad one. And when in doubt, change to a new battery! Name-brand alkaline batteries such as Duracell and Eveready are the best bet. While private label batteries are often nearly as good, their useful life can vary considerably from purchase to purchase. Make sure that to buy batteries that are date coded, and don’t accept any whose expiration date is less than three years away. And never use zinc carbon or toy batteries; most can’t even properly power up a modern wireless transmitter. Classically, many techs recommend against use of rechargeable batteries, and for good reason. Rechargeable batteries used to have much lower capacity than alkalines, and the useful life was usually short. This was particularly true of 9-volt units, whose operating life was a fraction of that of an alkaline. In the past five years, the technology for rechargeable batteries has improved dramatically. Now, NimH and LiPoly batteries are every bit as good as alkalines, and in some cases even better. Still, it is important to recognize the added complexity of using rechargeable batteries – a clear strategy will be needed for keeping them charged, tested, and removed from the pool when the time comes. By doing this, you can save considerable costs and it’s also better for the environment. Even more issues that are relatively simple to address can impact wireless performance. As a result, it’s not at all unusual for such equipment to interfere with wireless systems. Symptoms include low-level spurious tones, buzzing sounds, hissing and a varying noise floor. Digital interference can also cause an unexplained loss of range and other problems. Although FCC rules require that such equipment be tested to meet spurious emission standards, it’s a fact that not all units are indeed tested. In addition, loose covers and casings, warped metalwork, lax grounding and other mechanical shortcomings can greatly increase spurious RF emissions. Even properly approved digital equipment, in good working order, may generate enough RFI to affect wireless receivers located nearby. Digital audio equipment in close proximity to wireless systems can sometimes result in interference. When wireless interference occurs, one of the first things to do is to temporarily turn off digital devices to see if they are the source of the problem. Solution: As a general precaution wireless receivers should be located as far as possible from digital gear. Often just moving the equipment a few rack spaces apart is enough to solve a problem. More severe cases may require separating the wireless power, signal and RF cables from those going to the digital equipment. Using remote antennas with the wireless systems may also be helpful. And finally, try tightening up the covers on any offending digital gear and also adding a ground strap to the cabinet or other local ground point. Issue: Lapel (or lavalier) (microphone sound quality. Lapel mics can cause a number of different problems. 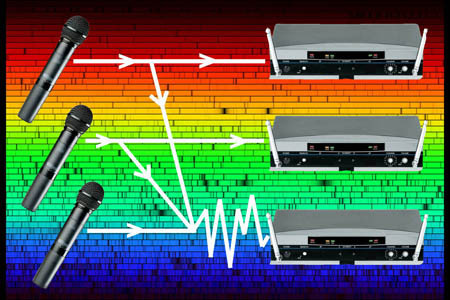 A common complaint is thin sound quality, which often occurs when the user has previously used only mics intended primarily for vocal applications. These mics generally boost low frequencies to make the voice sound warmer and fuller, but the omnidirectional mics normally used with wireless bodypack transmitter systems don’t have this boost and thus can sound noticeably different. Another cause of “thin audio” from lapel mics is interference. RF energy can “couple” into the mic cable and affect the preamplifier circuitry in the mic capsule. A high percentage of all lapel mics exhibit this problem under at least some circumstances. If the voice quality and level varies when the mic and cable are moved around in close proximity to the wireless transmitter antenna and body, it is almost certain that RF interference is present. Solution: In all cases, the manufacturer of the wireless system exhibiting this problem should be first contacted for specific recommendations. However, the problem is often solved with the addition of small RF bypass capacitors to the mic connector. Note that this should only be done by a qualified service professional only. Issue: Lapel mic feedback. Users new to wireless often complain that a system is defective because feedback occurs where none was present before. Part of the problem is that the lapel mics typically used with wireless are not directional and thus provide little feedback protection. However, the larger problem is usually that the mobility of wireless allows users to walk into zones more likely to cause feedback. Solution: Use lapel mics with a unidirectional pattern, or use headset mics. Moving the mic closer to the mouth and lowering gain is also helpful. Many users think headset mics are unsightly, but unidirectional mics can suffer from sudden drops in level when wearers turn their heads. The better solutions are acoustic, either by training users to avoid feedback zones, or by modifying the loudspeaker configuration to put feedback zones out of reach. Issue: Lapel mic mechanical problems. This is common to lapel mics, in particular because their cables are small, often delicate and typically get considerable abuse. Even if not damaged outright (i.e., the cable pulled out of the mic connector), lapel mic cables eventually wear out. Most often this wear occurs first at the connector end, but keep in mind that it can also happen at the capsule end. Usually the cable shield fails first due to constant bending in the area where a cable leaves the connector’s strain relief. A headworn mic can be an option in some cases, and there are a wide variety of lapel mics to choose from. 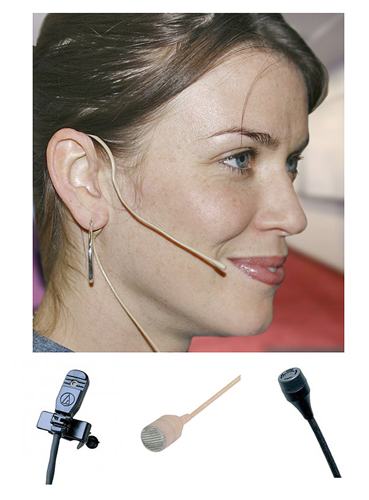 (Upper photo couresy of Electro-Voice, showing the company’s RE97 headworn mic. When this happens, clicks, pops, other noise and “lost audio” are experienced. Even before there’s a complete break in the shield, pops and clicks due to RF disturbances can happen. Therefore, it’s always prudent to check the cables when experiencing lapel mic noise of any type. Breaks at the connector end can usually be repaired (and don’t forget the bypass capacitors), but a break at the capsule end may not be fixable. Mechanical noise due to lapel mic capsules rubbing on clothing is relatively common and can usually be eliminated by using the right type of mic clip, one that holds the capsule away from the fabric. It may also be necessary to carefully secure the cable near the mic capsule. Static electricity sometimes creates audio noise, especially with certain types of fabric. Clothing anti-static spray usually solves this problem. Issue: System quality. It may seem strange to list “system quality” as a wireless problem, but a great many wireless difficulties start with inferior equipment. Inexpensive systems can often work well in rural areas and/or in relatively undemanding applications. But in larger cities and their surrounding suburbs plagued by typical frequency congestion and myriad interference sources, something better may be required. The same is usually true when more than a few systems must be operated at the same site. And, this situation is going to worsen, with more and more digital signal sources going on the air almost daily. The adoption of digital technology has greatly lowered the price of many audio products, but the impact of these advantages on wireless systems has been relatively small to this point. Wireless systems are still largely analog-based, and their manufacture is more labor intensive due to the requirement of considerable tuning, testing and tweaking. Quality components also tend to be expensive in comparison to digital components and are less adaptable to low-cost automated assembly. Unfortunately, there is yet no new magic technology that can cut the cost of a quality wireless system significantly - say 30 to 40 percent. Right now, if cost goes down, so do quality and performance. And it’s easier and cheaper for manufacturers to promote their mic capsules and “features” rather than build in better performance. Consequently there is a growing tendency to regard the RF portion of a wireless system as being relatively unimportant. This is a serious mistake. Solution: If a wireless system doesn’t have the selectivity and interference rejection to cut through all of the “junk” in the air, it doesn’t matter which mic elements it has, how neat the feature set, or how much money was “saved”. You’re simply left with something that doesn’t work like it should. The recommendation is to pay a little more and go for performance over features. High-quality wireless systems cost less than half of what they did 10 years ago, and they work better in virtually all cases. Final Thoughts: All in all, wireless microphone and in-ear monitoring systems can significantly enhance the experience for audiences and performers alike. Freedom of movement for actors, musicians, minsters, orators and politicians is a major benefit. However, the complexity, cost and potential problems are the risks of using microphones. By following the guidelines presented in this series of articles, you should be well on the way to flawless operation from wireless systems. Don’t forget that this is a changing world with respect to the RF spectrum and thus the operation of wireless mic systems. What works today may not work tomorrow. Your best bet is to stay informed and educated. 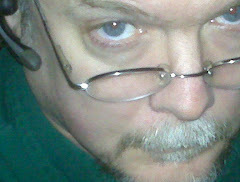 Watch for announcements about RF issues related to the FCC and potential other users of the spectrum. Keep up with the technology as manufacturers introduce new systems. And most of all, stay up on troubleshooting skills so you can identify where the problems originate. Sometimes the wireless will be at fault, and sometimes not. It’s best to know the difference.